Welcome to my Panasonic GX9 advanced manual with tips and tricks. This guide starts from your Menu settings and goes through all aspects of this interesting camera. I know it is a lot of information, but you’ll get the hang of it soon, I promise. As opposed the the video centric Panasonic GH5, the GX9 is more stills oriented camera, but it can still shoot 4K/60p video and offers both headphone and microphone jacks. I’ll be going over the entire Menu structure in this post, and giving you tips, pointers, and tricks along the way. You can change the aspect ratio of your photos here. 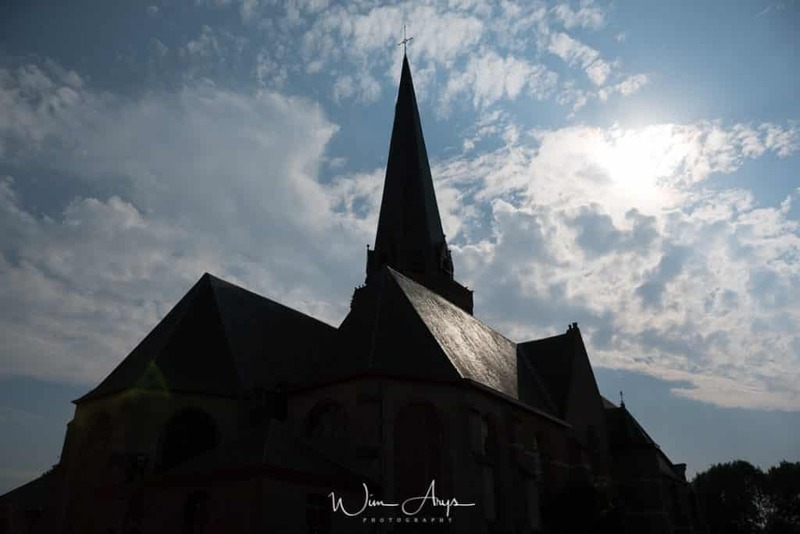 Changing the aspect ratio can be used as a way to boost your creativity, for instance landscapes often look great with a 16:9 ratio, or for sharing on Instagram, a 1:1 crop might suit you better. An M43 (Micro Four-thirds) camera has a native aspect ratio of (not surprisingly) 4:3. 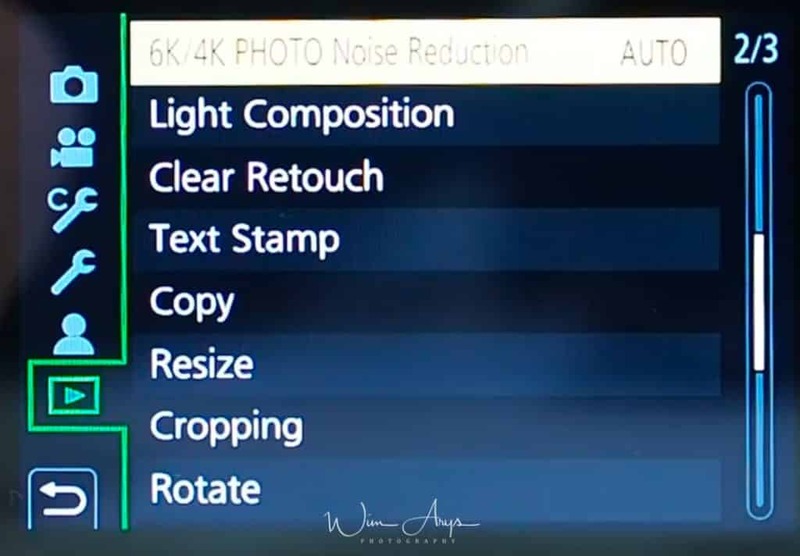 You should realise that changing the aspect ratio to anything else than this will actually crop the sensor, meaning that you’ll lose pixels. You should look at it as re-framing your image (like you can do in Lightroom or other photo editors) inside the camera. Jpeg’s will be stored with the chosen ratio, but RAW images (although previewed with the chosen ratio), will still have the full information of the 4:3 sensor retained. Picture Size sets the number of pixels for Jpeg (nor RAW). The higher the numbers of pixels, the more detail your pictures will have. When the aspect ratio is 16:9, you only use a wide crop of 14.5 MP of the sensor for a maximum image size of 5184 x 2920. When the aspect ratio is 3:2 you use 17 MP of the sensor and have an 5184 x 3456 image size. When the aspect ratio is 1:1, you use 14,5 MP of the sensor for an 3888 x 3888 image size. The Panasonic GX9 also has a digital teleconverter option, allowing you to zoom in by a factor of times 2 or times 4. This can be a handy feature if you don’t shoot RAW (see next item for more info). Thanks to in-body digital processing, the resulting Jpegs actually retain a larger image size than what you’d expect of de facto cropping the sensor by a factor 2 or 4. I would however only recommend using this feature if you’re a die hard jpeg shooter, since using RAW files and developing your images in Lightroom or another app will almost always get you better results. Probably the most important setting is Quality. You can select either Jpeg, where the RAW data from the sensor is processed by an in-camera algorithm to produce a viewable image, or save your images in this RAW format. RAW retains all the data of the sensor, and is meant to be edited afterwards in a desktop application like Lightroom. Saving as RAW means that you have much more creative freedom afterwards to push shadows or pull highlights, sharpen and enhance your image in any way you please. A Jpeg retains only a fraction of this information, according to the algorithm inside the camera which might or might not suit your style and/or needs. Hence, my recommendation is always to shoot RAW or RAW Jpeg. This does mean larger files, but SD cards are inexpensive compared to your beautiful new Lumix. But some photographers prefer to shoot in Jpeg only because they are for instance not interested in post-processing images. In this case, I would set the Jpeg to the highest quality setting. 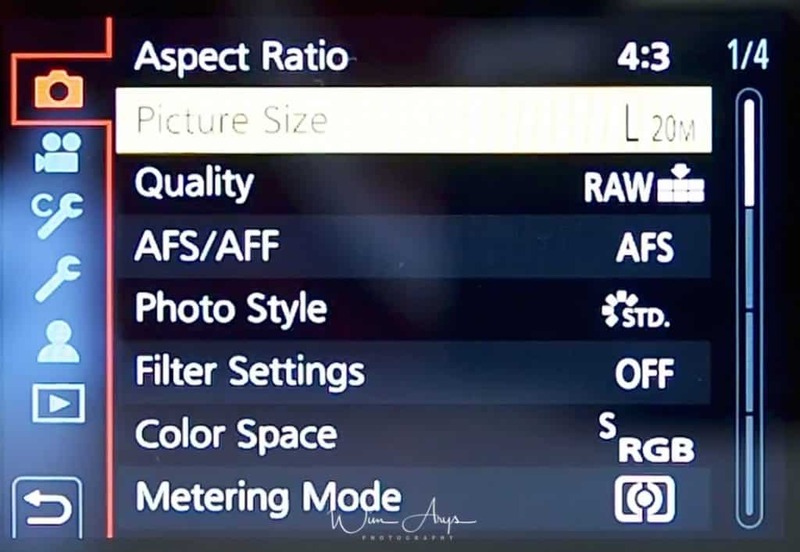 If you only shoot in RAW, the image on the rear screen when reviewing the images are of a very low quality. When you import to the computer they are fine but it might be better to shoot both RAW and JPEG. AFS is an abbreviation of Auto Focus Single and AFF is an abbreviation of Auto Focus Flexible. 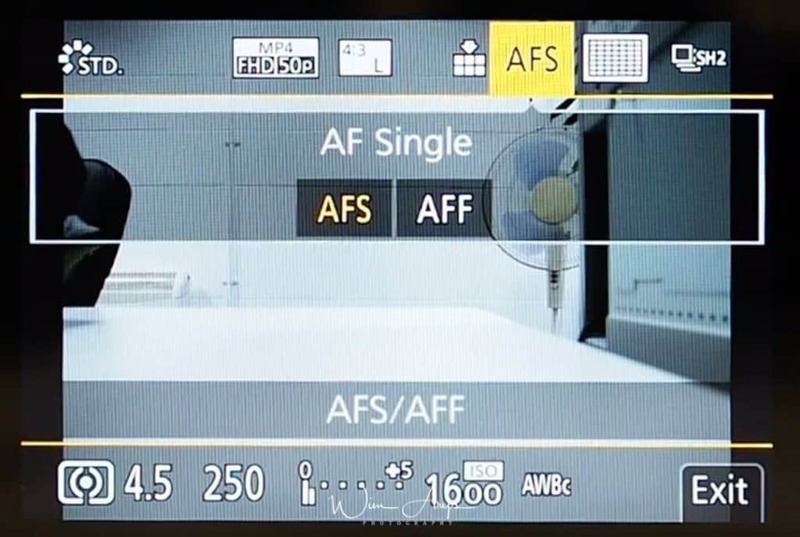 In AFS, the focus stays locked while the shutter button is pressed halfway and in AFF focus is continuously readjusted according to the movement of the subject. See AFF as a function between Single AF and Continuous AF. The AFC function below AFS/AFF continuously changes focus according to the movement of your subject. AFS will find focus and stay focused at that distance until you take a photo or release the shutter button. This is handy if you want to focus and then recompose your shot for instance. AFF will do the same unless it detects subject movement, at which time it will temporarily switch to AFC operation in order to re-focus. AFC won’t start to seek focus until you half-press the shutter, and will continually evaluate subject movement and change focus as needed. 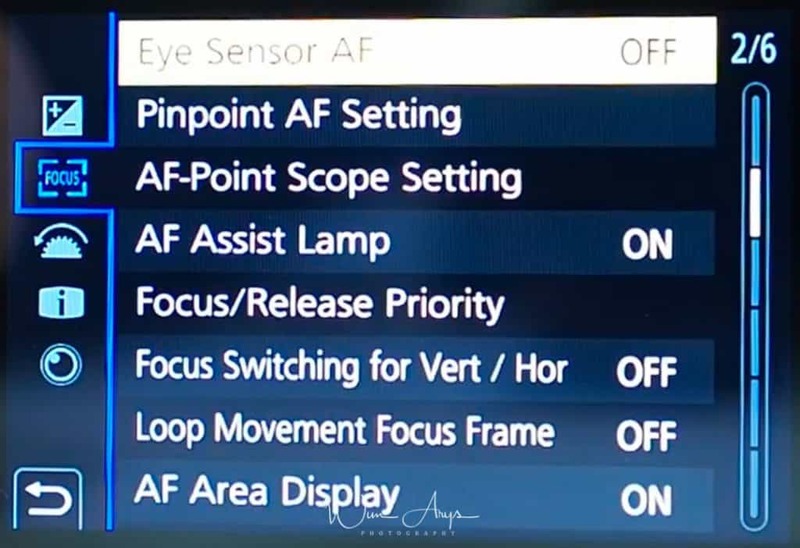 With AFS you can can lock focus on a particular point, then swing the camera to get the right framing; with AFC, it will not lock focus, but will keep re-focusing. That’s why Pinpoint focusing can’t be used with AFC. This applies only to Jpeg images, and the RAW preview. You can select a colour effect here. Standard: standard Panasonic colour and contrast rendering. Vivid: Brilliant effect with high saturation and contrast. Natural: Soft effect with low contrast. Monochrome: Monochrome (black and white)effect with no color shades. L.Monochrome: Black-and-white effect with rich gradation and crisp black accents. Scenery: An effect appropriate for sceneries with vivid blue skies and greens. Portrait: An effect appropriate for portraits with a healthy and beautiful skin tone. Custom 1-4: Make your own presets for easy recall when needed. Cinelike D: Gives priority to the dynamic range by using a gamma curve designed to create film-like images. Suited for editing. Cinelike V: Gives priority to the contrast by using a gamma curve designed to create film-like images. As mentioned earlier, it’s possible to create your own Photo Style or customise the preset styles. This is basically a way of hacking into the Jpeg engine and adjusting it to your own style and preferences. There are 6 areas that you can alter. Contrast: add or decrease the difference between the brightness and the darkness in the picture. Sharpness: add a degree of sharpness or make your images softer. Noise Reduction: add noise reduction for high ISO shooting. Saturation: add more vividness to the colours. Or remove some. Color Tone: add a blue, orange, red or green filter to your image. The filter Settings go a step further than merely a photo style. These include artistic effects like Low Key, Sepia, Cross Process and retro stylings. You can turn them ON or OFF here, select the effect you want to use and change the settings by using the touch screen. You can also set your camera up to shoot one with and one without an image effect simultaneously. If you’re wondering how you get to Creative Control mode, you need to set the mode dial to the paint palette. And simply press up and down to select the image effects. You can also display the selection screen by touching the Recording Mode icon in recording screen. Sunshine: you can select the position and size of the light source here. One Point Color: you can select the color to leave in here by using a color picker. Select either sRGB or Adobe RGB here. Adobe RGB has a greater range of reproducible colors than sRGB, so it might be worth looking into this color space if you print to paper a lot. But remember that you’ll also need a monitor capable of reproducing the larger color range too. And this can often lead to problems when converting to sRGB or editing your images in external applications. Because of all this, I have it set to sRGB. You can change how the light is metered here, and hence how a correct exposure is calculated by the camera. If you feel that the camera takes over- or underexposed images according to your personal preferences, it might be worth changing the metering mode. Multiple: This is the method in which the camera measures the most suitable exposure by judging the allocation of brightness on the whole screen automatically. Center weighted: This is the method used to focus on the subject on the center of the screen and measure the whole screen evenly. Spot: This is the method to measure the subject in the spot metering target. Standard: no adjustments is set. Raise the contrast: Bright areas are brightened, and dark areas are darkened. Lower the contrast: Bright areas are darkened, and dark areas are brightened. Brighten dark areas: Dark areas are brightened. Custom: make your own preset. Rotate the front/rear dial to adjust the brightness of bright/dark portions. The rear dial is for adjusting dark areas, and the front dial is for adjusting bright areas. To register a preferred setting, press ▲, and select the destination where the custom setting will be registered to [Custom1]/[Custom2]/[Custom3]. Adjustments can also be made by dragging the graph. The screen display can be switched by pressing [DISP.] on the brightness adjustment screen. back to the default setting. This setting will change contrast and exposure when there is a big difference from the darkest area to the brightest are in your image. What really happens is that the camera adjusts the exposure in order to capture more details in the highlights. You can choose between High, Standard, Low or Off. This naturally causes an under-exposure in the shadow areas. 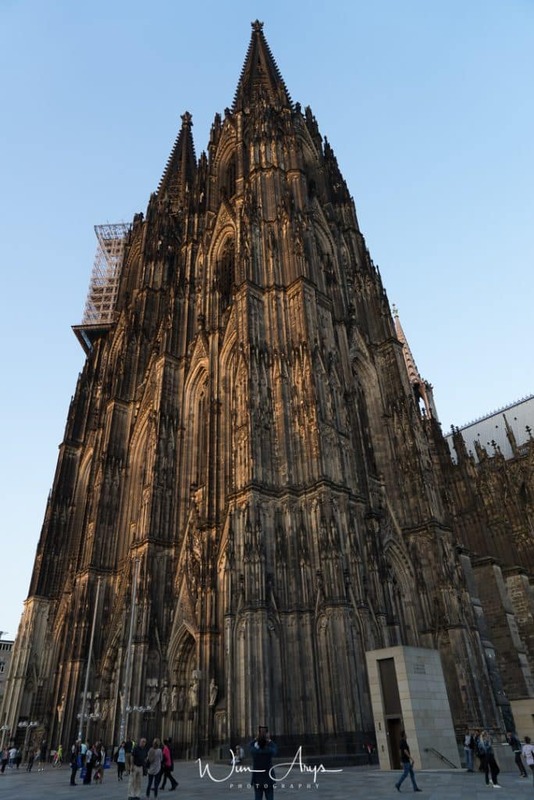 But inside the jpeg engine, the camera will compensate for this by boosting shadows. The downside here is that this will obviously lead to more noise in the boosted regions, but because this is done with data directly coming from the sensor, it can be quite useful if you are a jpeg shooter. There is also an impact on RAW images, because the exposure will be underexposed. Another jpeg only functionality, i-Resolution is a form of sharpening. High, Standard, Low and Off are selectable, and you should see these like the threshold for sharpening in an application like Lightroom. 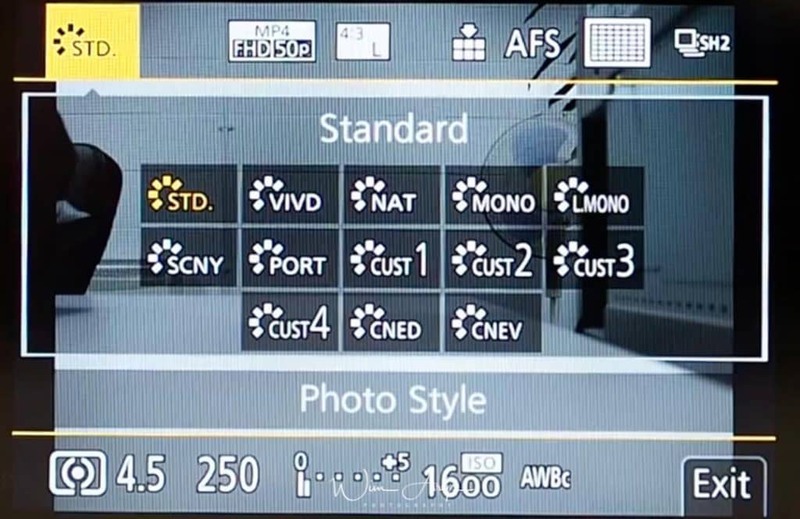 Many photographers discard these intelligent functions, and if you shoot RAW only, it’s not that important for you (except i Dynamic which can change your exposure plus or minus 1/3 stop). But if you shoot jpeg only, you should set it to Low at least, since most of the time RAW files would be sharpened in post processing too. If you use a flash when using Red-Eye Reduction, the camera will automatically detect red-eye and corrects the picture. Sets the upper and lower limits of the ISO sensitivity when you use Auto ISO or i ISO. Lower Limit should be set to 200 and upper limit to 3200, this is the range where you’ll get usable images without too much noise. 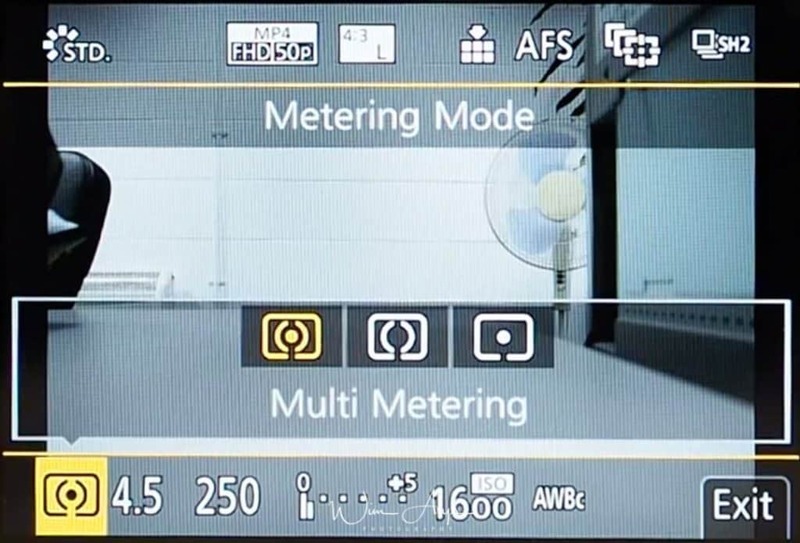 A very important setting if you feel that the Panasonic GX9 is producing blurry images for your shooting style. Birds in flight, for instance, will need a faster shutter speed than many other types of photography. 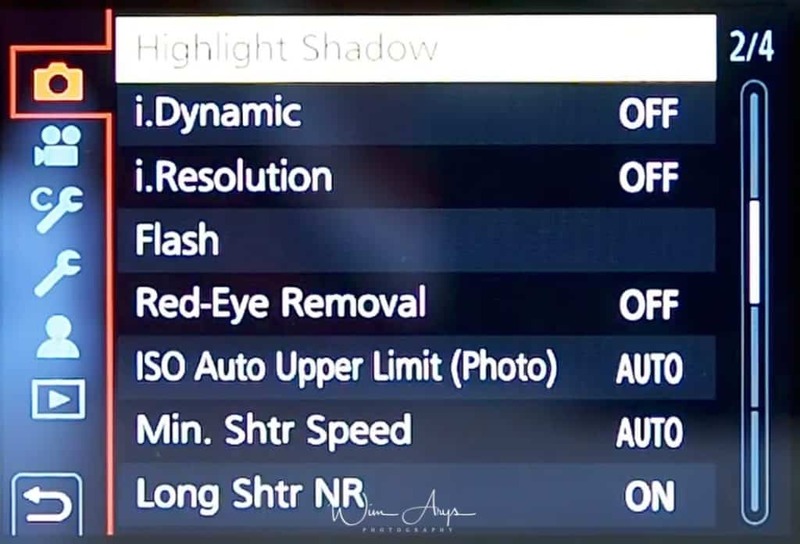 Since most of the time, you’ll need to raise ISO to gain faster shutter speeds, Panasonic (and many other camera producers) have made this option available. You can set it to Auto, or choose a minimum shutter speed up to 1/32000. The latter is a bit high, but as I mentioned, if you shoot action sports or for certain types of nature photography, a minimum shutter speed of 1/1000 or 1/2000 should be set. At these speeds, you can begin to “freeze” action. The camera will automatically apply noise reduction to long exposures. This applies to both Jpeg and RAW files. A black frame is taken after your initial shot to measure the noise present. Since many environmental factors (like temperature and location) have an effect on the amount of noise that you’ll see, this is the best way to determine what is noise in your frame. This data is then subtracted from your image for a noise-free (more-or-less) result. All lenses have a lens profile that registers both distortion and shading in the corners at all apertures. These lens profiles can be applied in-camera to counter unwanted vignetting in your images. Especially important for jpeg shooters to turn this on. RAW shooters can apply these corrections later on (and with better results) in a desktop application like DXO optics Pro. When you stop down your lens to a smaller aperture (normally from f/11 to f/22), a phenomenon called diffraction causes a loss in sharpness. It happens because light begins to disperse when passing through a small opening. When diffraction compensation is set to ON, the Panasonic GX9 will add sharpening to your image to try and counter this phenomenon. You should use it if you shoot jpeg. The Panasonic Lumix GX9 has a stabilised sensor. The sensor inside the camera is suspended on a magnetic field and can compensate for movement like the minute shakes of your hands or any other kind of movement. There are also many lenses available with an optical image stabilisation unit, that physically move glass elements around inside the lens to do the same. 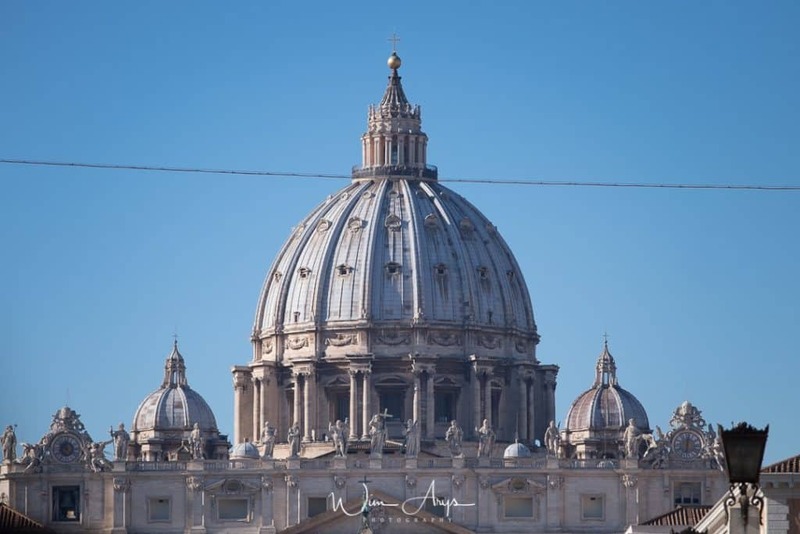 Both systems have their pros and cons, and it is generally accepted that a stabilised sensor works better for wide angle lenses (below 40mm) whilst optical lens stabilisation is more efficient for the tele range. It is also possible to use both systems at the same time (called Dual I.S. ), where you’ll take advantage of the best of both worlds. It’s also possible to use the in-body sensor stabilisation with older, manual primes that don’t relay EXIF information (like most importantly focal length in this case). You’ll need to manually set the focal length in the Focal length Set function to get an optimal performance. You can digitally enlarge pictures without too much quality deterioration with this function. Only for jpeg use, you can extend the range of your lens by times 1.4 or 1.6 using this function. Digital zoom takes this a step further, allowing you to zoom in up to 4 times for jpeg’s. I would not recommend either of these functions, as it is better to shoot RAW in this case and crop in processing for the best possible quality. 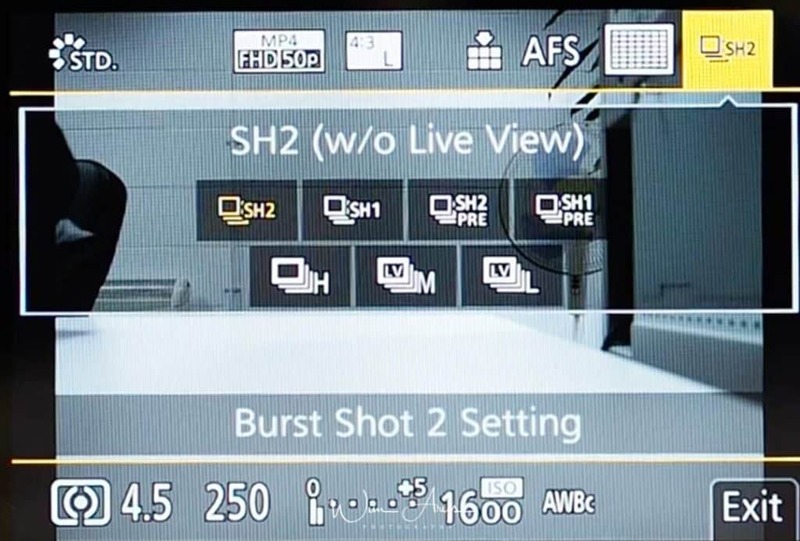 The drive mode dial has two options for burst shooting. Burst shooting means that you’ll shoot continuously when you press the shutter button. You can apply different Burst Mode settings to Burst Shot 1 and and Burst Shot 2 Setting in these menus. You’ll see SH (for super high burst rates), SH pre (which actually goes back a few seconds in time and saves these images too). These SH modes are only available with the electronic shutter. Version 2 is always faster that version 1. Then we have High, Medium and Low which work with the Mechanical shutter too. The actual burst rate will be higher if you shoot Jpeg only. 4K photo mode is designed to help you to capture fleeting moments by letting you shoot at an incredible 60fps for 4K mode. Continuous autofocus mode is automatically activated and it draws on 4K video technology to shoot 18 MP image at this fast frame rate. You’re basically recording video where you can extract the frames in-camera. Press the play button to located the files. 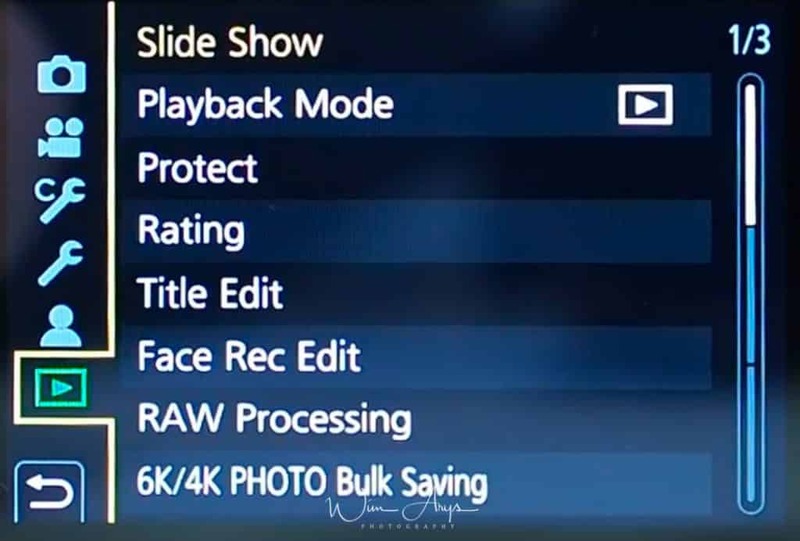 Clips recorded in 6K Photo Mode are marked with the 4K Photo icon to make the easy to identify. Once you’ve found the clip you want, either tap the 4K Photo Icon on-screen or the Up navigation key. If you have a long clip with fleeting moments of action you may like to use the slide bar at the top to quickly scroll to an interesting bit of footage. Alternatively, there’s a playback option (button Fn1) that you can use to play and pause the movie. Once you’ve found the area you’re interested in, tap the Frame View Icon to see a scrollable stack of frames, just swipe right and left to locate the best shots. When you find an image you like, tap the Menu/Set button or 4K Icon to save the image. Images are saved as jpegs. Tap the Menu button and scroll down to Playback (the 6th tab), then scroll to the second page of options and select 4K PHOTO Bulk Saving. Then swipe on the screen until you find the clip that you want to extract stills from. Now use the same on-screen movie navigation controls as you used before to find the first frame of the 5 seconds that you want to pull the stills from and tap the 4K Photo icon to save it and the image from the next 5 seconds. 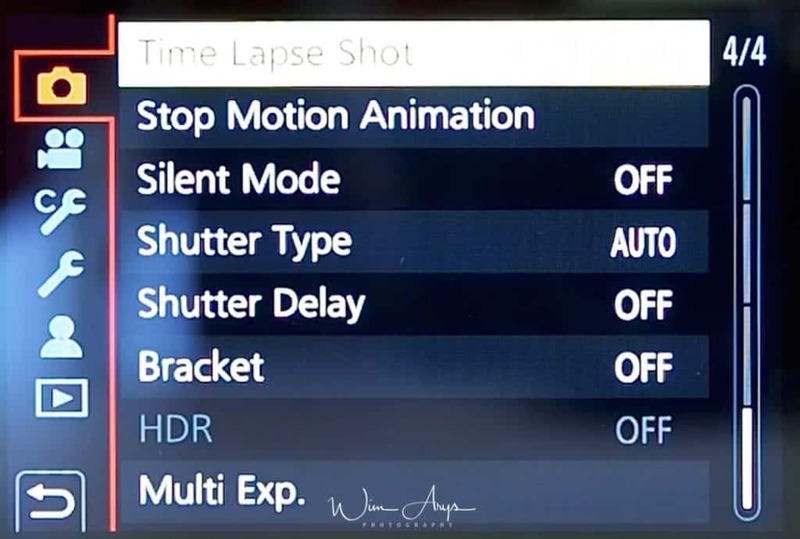 In this menu, you can select what type of self timer you’d like to use: a 10 second delay and one shot, 10 seconds with 3 shots with 2 second intervals or a 2 second delay, all after pressing the shutter. 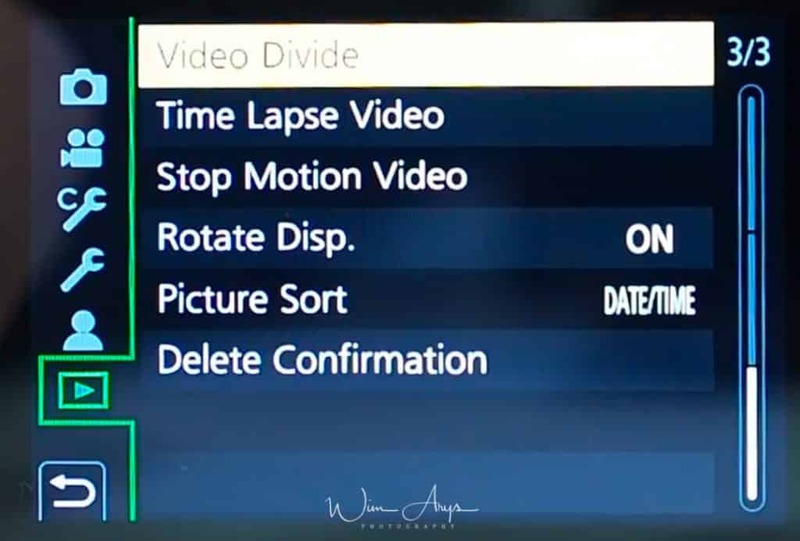 You can choose between Time Lapse or Animation in this menu. Switch to Time Lapse Shot if it is not selected. change start time and shooting interval according to your preferences. press te shutter half way to exit the menu. press the shutter to start your time-lapse. Disables operational sounds and output of light at once for completely silent stealth mode shooting with the Panasonic GX9. You can use either the mechanical or electronic shutter, or 50/50, or let the Panasonic GX9 decide what is most appropriate. 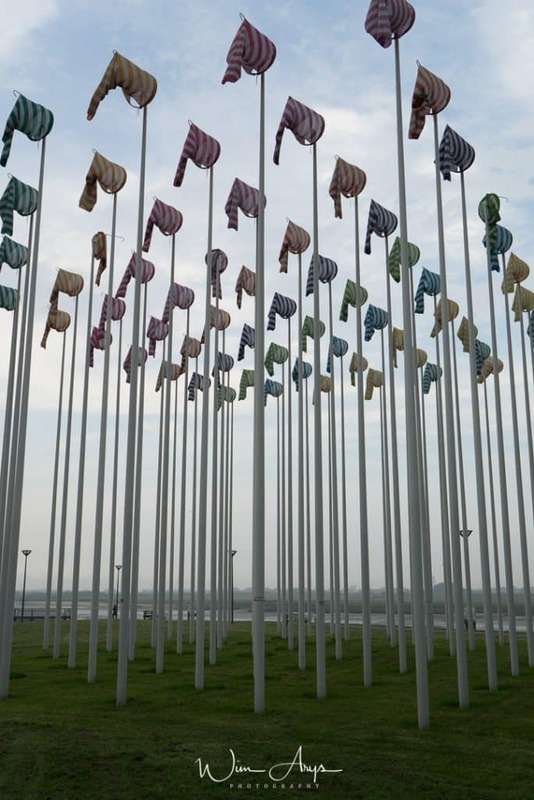 The electronic shutter has a maximum speed of 1/32000 sec, the mechanical shutter can go up to 1/8000 second and if you use the Electronic first curtain shutter, you can only go up to 1/2000 second. AUTO: Switches the shutter type automatically depending on the recording condition and shutter speed. MSHTR: Takes pictures in Mechanical Shutter Mode. EFC: Takes pictures in Electronic Front Curtain Mode. ESHTR: Takes pictures in Electronic Shutter Mode. Remember that in artificial light or when using a flash, you best use the mechanical shutter only to avoid artefacts. To reduce the influence of hand shake or shutter vibration, shutter is released after the specified time has passed. 1, 2, 4 or 8 second delay are selectable. Keep your hands steady and don’t use this delay, else you might miss that critical moment. The Bracket function allows you to take multiple pictures while automatically adjusting a setting like exposure or aperture by pressing the shutter button. Exposure Bracket: Press the shutter button and the Lumix will sequentially take multiple images with different exposures. You can select the number of pictures to be taken and the exposure range (from 1/3 EV to 1 EV stops difference). Aperture Bracket: Press the shutter button and the Lumix will sequentially take multiple images at different apertures. 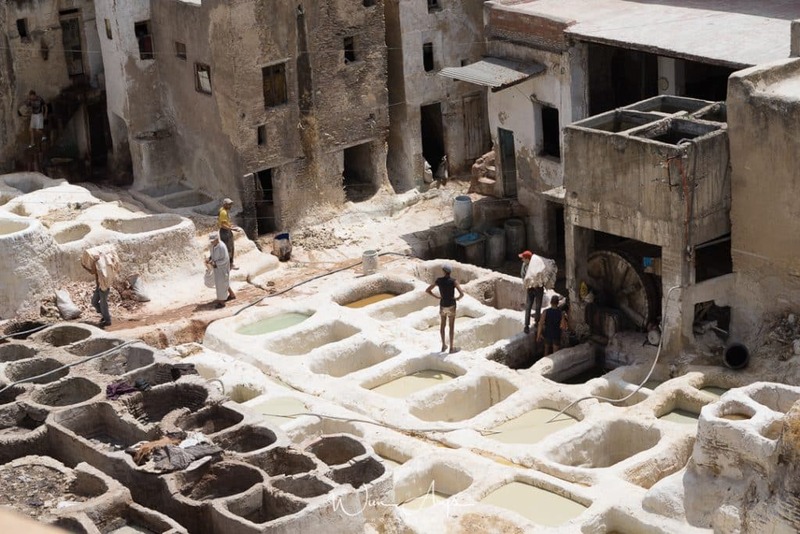 Either select all apertures or a number of shots (3-5) within a selected range. Focus Bracket:Press the shutter button and the Panasonic GX9 will sequentially take multiple images with different focus positions. You can select the distance between focus positions, the number of exposures and the sequence from far to near or the other way around. White Balance Bracket (color temperature): Press the shutter button once to take three pictures with different White Balance Color Temperature values automatically. You can also set the correction range by touching the up/down slider on the screen. You can combine 3 image with different levels of exposure into a single picture a high dynamic range. 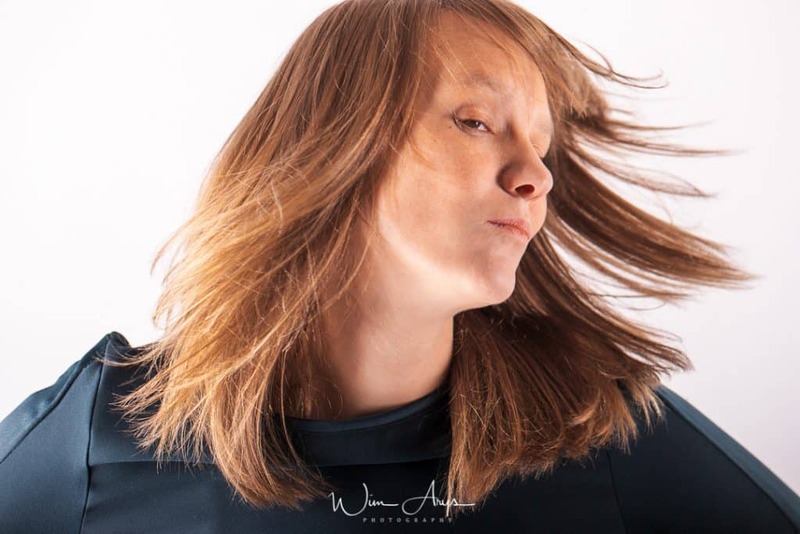 This way, you can minimise the loss of gradations in bright areas and dark areas when, for example, the contrast between the background and the subject is large. Dynamic range: either select Auto where the camera will decide what range of exposure is suitable, or manually select plus/minus 1,2 or 3 EV. Auto Align: Automatically aligns the resulting images to adjust for movement or not. I multiple exposure is basically laying 2 (or more) images on top of each other. This is different to a HDR or composite shot in the sense that these images should be totally different from each other. It’s a technique the comes from the darkroom photography area where 2 negatives where placed on top of each other to create a totally new image with the two images combined. Press up/down to select start and then press Menu/Set. Decide on the composition and take the first picture. After this first image, press the shutter halfway down to take the next image. Shoot a third or fourth exposure. all these images will add up to make a multiple exposure. Press the down arrow to exit or press the shutter button fully down. You multiple exposure is finished, and you can view it on the screen. These are all movie related settings, and menu of them are the same as the stills related menu options. YOu can however (obviously) set them up differently for video. 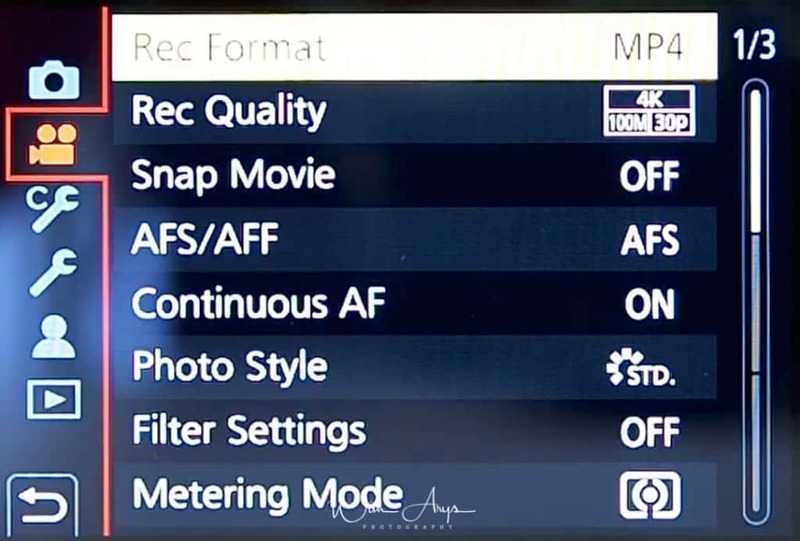 You can either choose to record in AVCHD or MP4 format. The higher the Bit rate value is, the higher the picture quality becomes. Since the camera employs the VBR recording method, the bit rate is changed automatically depending on the subject to record. As a result, the recording time is shortened when a fast-moving subject is recorded. Different frame rates and bitrates are selectable per format in the Rec Quality setting. Focusing changes depending on the Focus Mode setting and the Continuous AF setting in this menu. On: The camera automatically keeps focusing on subjects during recording. Off: The camera maintains the focus position at the start of recording. You can use manual focus. You can select a photo style (like for photography, see above) for video too. You can add the image effects (filters) of Creative Control Mode, see the stills info on this above. For more info, see the equivalent setting for photos above. This naturally causes an under-exposure in the shadow areas. But inside the jpeg engine, the camera will compensate for this by boosting shadows. The downside here is that this will obviously lead to more noise in the boosted regions, but because this is done with data directly coming from the sensor, it can be quite useful. i-Resolution is a form of sharpening. High, Standard, Low and Off are selectable, and you should see these like the threshold for sharpening in an application like Lightroom. 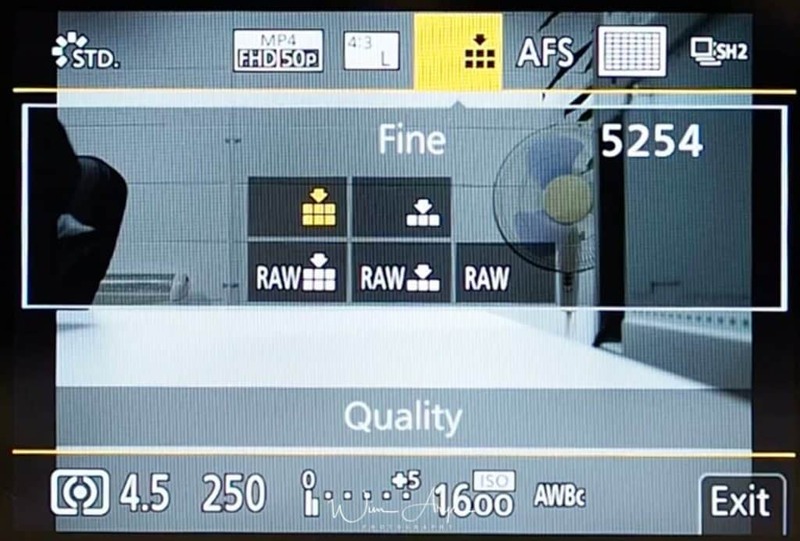 Many photographers discard these intelligent functions, and if you shoot RAW only, it’s not that important for you (except i Dynamic which can change your exposure plus or minus 1/3 stop). 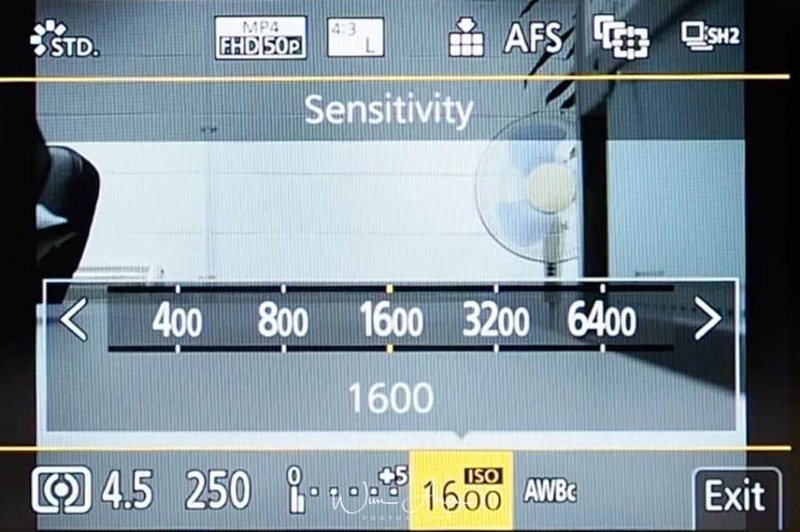 Set the upper and lower limits of the ISO sensitivity when it is set to AUTO. When you stop down your lens to a smaller aperture (normally from f/11 to f/22), a phenomenon called diffraction causes a loss in sharpness. It happens because light begins to disperse when passing through a small opening. When diffraction compensation is set to ON, the Panasonic GX9 will add sharpening to your image to try and counter this phenomenon. The shutter speed can be fixed to reduce the flicker or striping in your movies. 1/50,/1/60,1/100 or 1/120 second are available. You can digitally enlarge movies without too much quality deterioration with this function. You can extend the range of your lens by times 1.4 or 1.6 using this function. Digital zoom takes this a step further, allowing you to zoom in up to 4 times. You can record still pictures while recording a movie on the Panasonic GX9. During movie recording, press the shutter button fully to record a still picture when turned On. Aspect will always be 16:9. Pictures will be recorded with a picture size determined by the Rec Quality setting for motion pictures. Pictures will be recorded with the set picture size and quality. The screen will go dark while recording pictures. A still picture will be recorded in the motion picture during that period, and audio is not recorded. Select if you want to display the microphone level on the recording screen. Adjust the sound input level to 19 different levels (-12 dB to +6 dB). This will reduce the wind noise coming into the built-in microphone while maintaining sound quality. You can choose either High, Standard or Off. This function works only with the built-in microphone. You’ll find all customisable settings of the Panasonic GX9 in this Menu. Choose the increments of exposure changes between 1/3 EV or 1 EV. 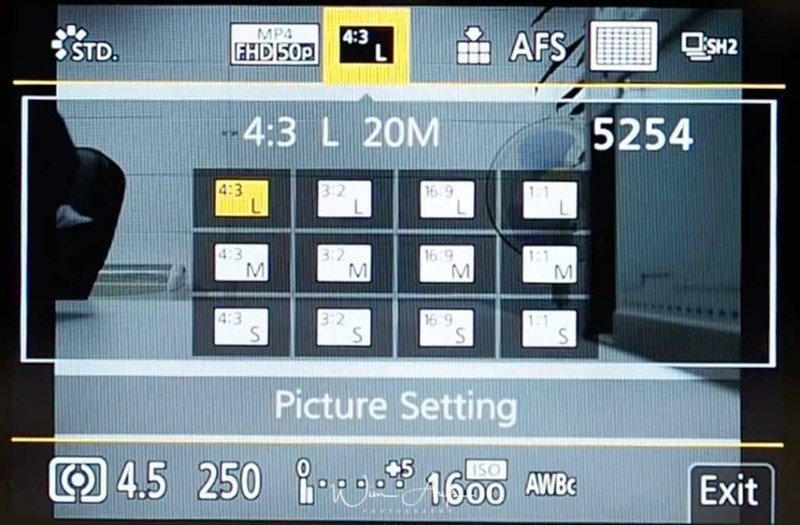 ISO sensitivity can be set up to minimum of ISO 100. Base ISO of the sensor is 200, so this extended ISO basically halves this in software, with a slight decrease in quality. An exposure value can be reset when the Recording Mode is changed or the camera is turned off. 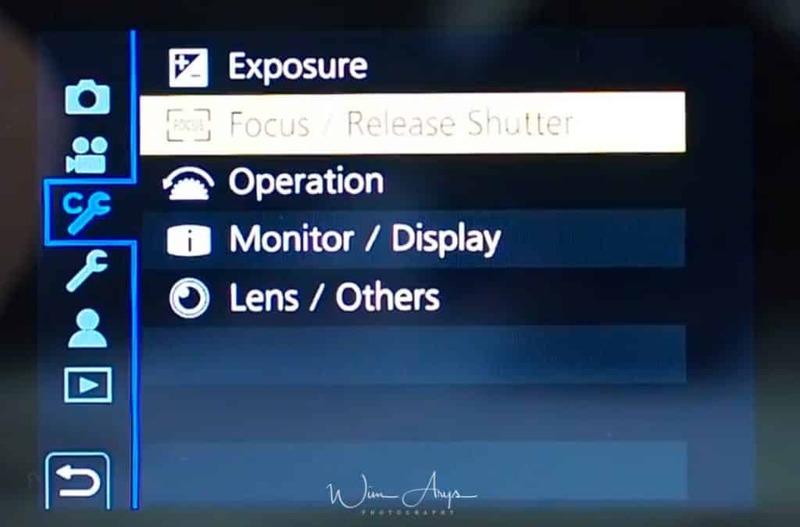 Lock focus and exposure with AF/AE LOCK. To clear the lock, press AF/AE LOCK again. 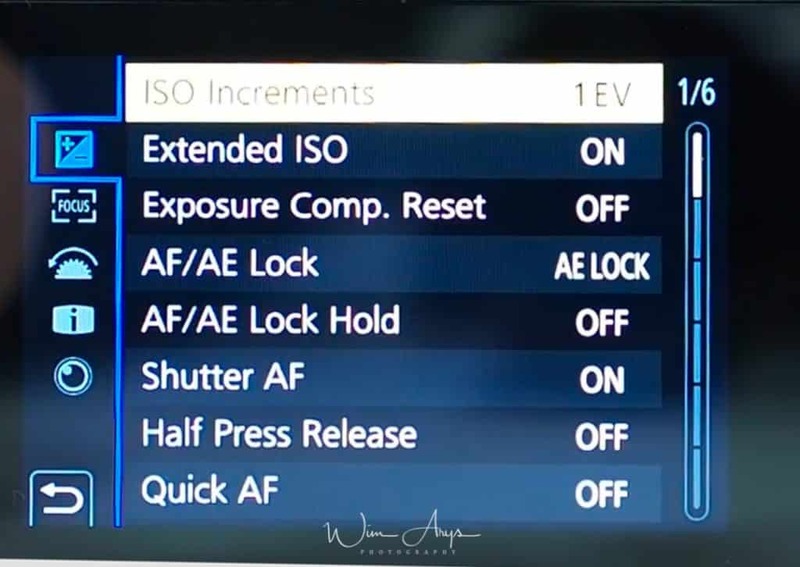 When ON is selected, focus and exposure stays locked even if you press and release AF/AE LOCK. To clear the lock, press AF/AE LOCK again. Set whether or not the focus is adjusted automatically when the shutter button is pressed halfway. The shutter will immediately fire when the shutter button is pressed halfway when this is ON. As long as the camera is held steady, the camera will automatically adjust the focus and focus adjustment will then be quicker when the shutter is pressed. You’ll get better AF performance at the expense of battery life. The Panasonic GX9 wil automatically start autofocus when the eye sensor is activated. The screen will be zoomed in when the shutter is pressed halfway, selectable in full screen or in a window. The methods for displaying the magnification window. View magnification full screen or picture in picture. AF assist lamp will illuminate the subject when the shutter button is pressed half-way making it easier for the camera to focus when recording in low light conditions. Range is about 1 meter. Set whether to give priority to focus or shutter release during Auto Focus. Setting it to Focus priority means you won’t be able to take an image if focus is not acquired. Release will. Memorises separate positions for horizontal and vertical orientations (two vertical orientations, left and right, are available). 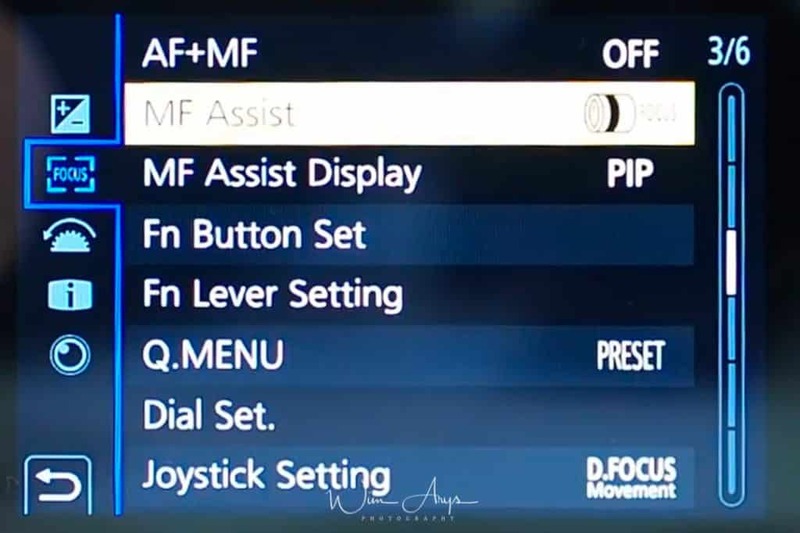 When setting the AF area position or the MF Assist display position, you can now loop the position from one edge to the other edge of the screen. Selects whether you want to see a visual representation of you selected AF area on screen. 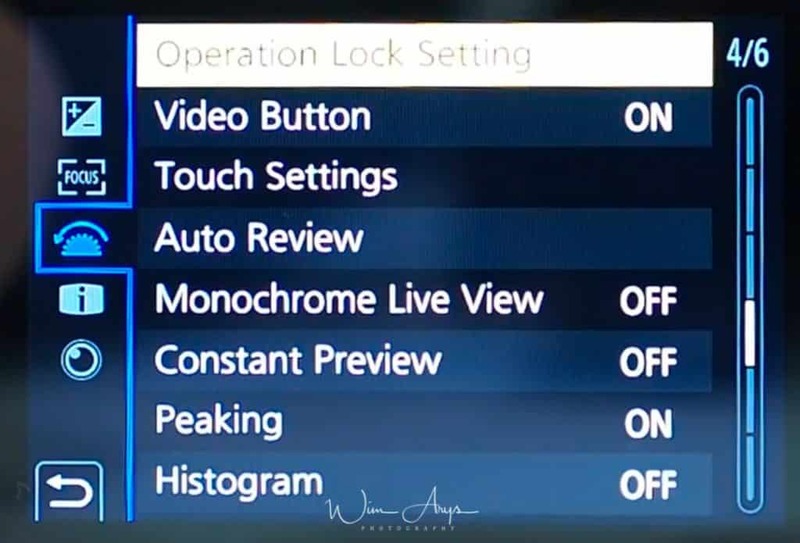 When AF Lock is ON (press the shutter button halfway with the focus mode set to AFS or set AF Lock using AF/AE LOCK), you can make fine adjustments to the focus manually. 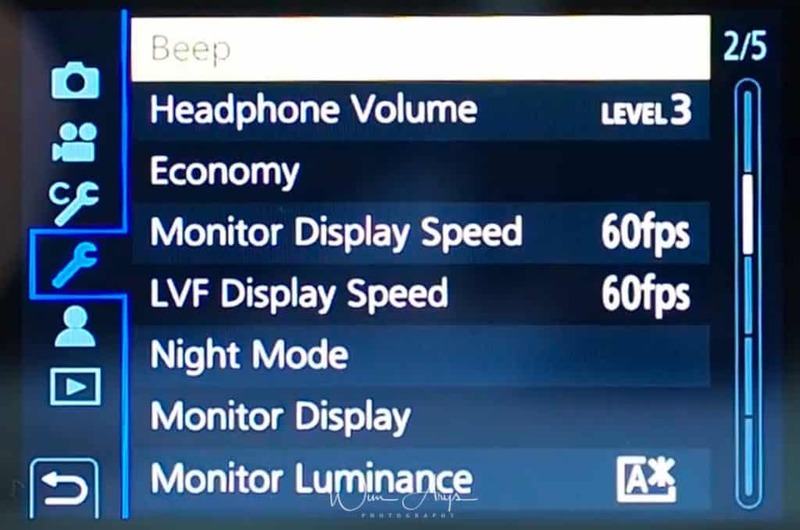 Sets the display method of MF Assist (enlarged screen) on the Panasonic GX9. Sets whether MF Assist (enlarged screen) will appear in a windowed screen display or in a full screen display. You can assign various features, such as recording functions, to specific buttons and icons as well as the function lever. Press up/down to select the function button you want to assign a function to and then press MENU/SET. Press up/down to select the function you want to assign and then press [MENU/SET]. You are also free to assign any function to the FN lever using the same method as Fn Button set. In Custom operations, you can customise the Q Menu according to your liking. You can add a maximum of 15 preferred settings to the Quick Menu. Press Q.MENU to display the Quick Menu. Press down to select the custom tool and then press MENU/SET. Press left/right arrow to select the menu item in the top row and then press MENU/SET. Press return to switch to the recording screen. Assign Dial (F/SS): Assigns the operations of the aperture value and shutter speed in Manual Exposure Mode. Rotation (F/SS): Changes the rotation direction of the dials for adjusting the aperture value and shutter speed. Control Dial Assignment: It sets the item to be assigned to the control dial while the recording screen is displayed. Exposure Comp. : Assigns the Exposure Compensation to the front dial or rear dial so that you can directly adjust it. Dial Operation Switch Setup: Sets the items to be assigned temporarily to the front/rear dials when you press the function button to which Dial Operation Switch is assigned. The joystick provides the same functions as the cursor buttons MENU/SET button. Sets the control functions on the Panasonic GX9 to be disabled with the function button Operation Lock. Cursor, Joystick and Touch screen can be turned off. Enables/disables the motion picture button. Touch Screen: All touch operations are turned on. Touch Tab: Operations of tabs are enabled. Touch AF: Operation to bring the subject you touch into focus AF or adjust the focus and brightness AF+AE are enabled. Touch Pad AF: Operation to move the AF area by touching the monitor when the viewfinder is in use. Displays a picture immediately after it is taken. You can display the recording screen in black and white. Recorded images will not be affected. 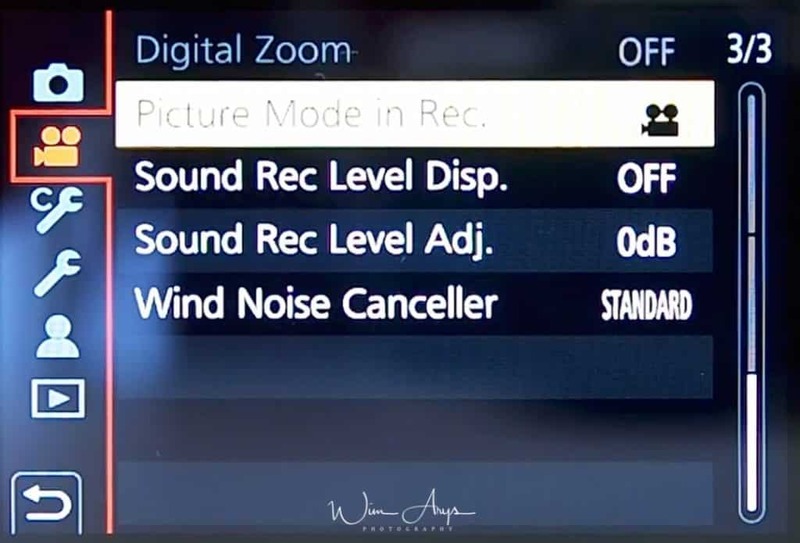 You can check the effects of the chosen aperture and shutter speed on the recording screen in Manual Exposure Mode. Some camera makers call this Live View. In-focus portions (portions on the screen with clear outlines) are highlighted when focus is being adjusted manually. Great focussing aide for manual focussing. Can be set to High or Low. Display the histogram. A histogram is a graph that displays brightness along the horizontal axis (black to white) and the number of pixels at each brightness level on the vertical axis. It allows you to easily check a picture’s exposure. 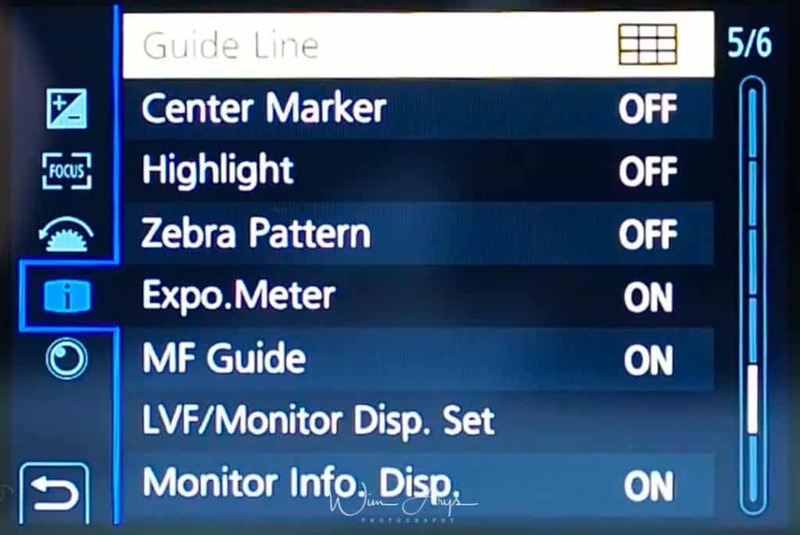 This will set the pattern of guide lines displayed when taking a picture. The center of the recording screen will be displayed as [+]. When the Auto Review function is activated or when playing back, white saturated areas appear blinking in black and white. Indicates parts that may become white saturated through overexposure in a zebra pattern. You can select a brightness value between 50% and 105%. In Zebra 2, you can select OFF. If you select 100% or 105%, only the areas that are already white saturated are displayed in a zebra pattern. The smaller the value is, the wider the brightness range to be processed as a zebra pattern will be. Set to ON to display the Exposure meter when performing Program Shift, setting aperture, and setting shutter speed. Unsuitable areas of the range are displayed in red. When the Exposure meter is not displayed, switch the display information for screen by pressing DISP. 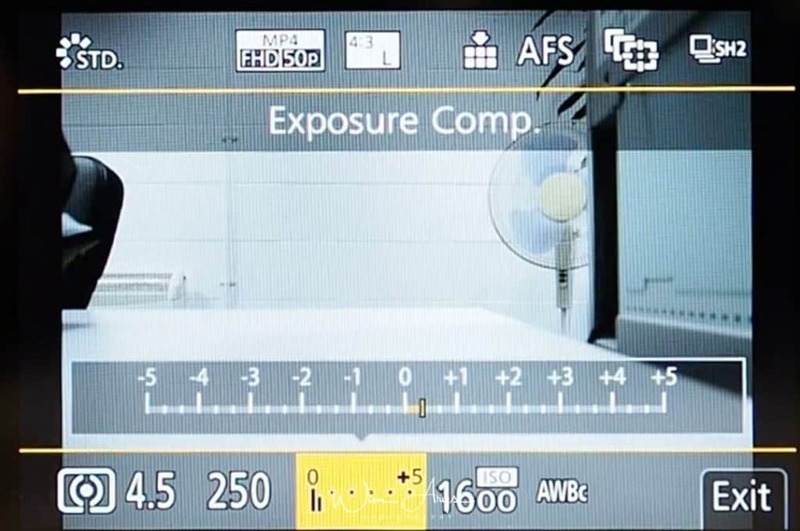 If no operations are performed for approximately 4 seconds, the Exposure meter disappears. When you set the focus manually, an MF guide that allows you to check the direction to achieve focus is displayed. You can select separate screen display styles for the viewfinder and the monitor. Display the recording information screen. Viewfinder style: Scales down images slightly so that you can better review the composition of the images. Monitor style: Scales images to fill the entire screen so that you can see their details. This changes the angle of view during motion picture recording and still picture recording. Displays the recording area according to the angle of view for still picture recording or video. This will switch display between the number of recordable pictures and available recording time. Display a selection screen when you set the mode dial to the paint palette icon. Saves the focus position when you turn off the camera. When an interchangeable lens that is compatible with power zoom is in use, the zoom position is also saved. Change the settings for a power zoom lens. Sets the screen display and lens operations when using an interchangeable lens that is compatible with power zoom. Disp Focal Length: When you zoom, the focal distance is displayed and you can confirm the zoom position. Step Zoom: When you operate the zoom with this setting [ON], the zoom will stop at positions corresponding to predetermined distances. Zoom Speed: You can set the zoom speed for zoom operations for both stills and vide to high, medium or low. Zoom Ring: When set to OFF] the operations controlled by the zoom ring are disabled to prevent accidental operation. Sets the function to be assigned to the focus button of an interchangeable lens. You can call up the assigned function by setting the focus selector switch of a compatible interchangeable lens to Fn and then pressing the focus button of the lens. Face Recognition is a function on the Panasonic GX9 which finds a face resembling a registered face and priorities focus and exposure automatically. Even if the person is located towards the back or on the end of a line in a group photo, the camera can still take a clear picture. On will automatically recognise faces, but you can also register up to six faces yourself. In this Menu, select an empty frame (or overwrite one). Take an picture of the face you want to register. Register this face. Note that you can register up to 3 images per face for more accurate results. If you set the name and birthday of your baby or pet in advance, you can record their name and age in months and years in the images. Display the URL or QR code to go to the online manual. 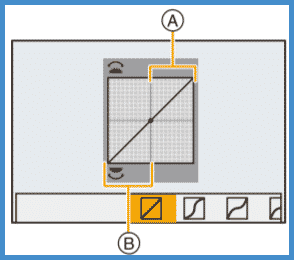 Up to 5 sets of current camera settings can be registered using C1, C2, C3-1, C3-2 or C3-3. The first three are directly accessible via the Mode Dial. 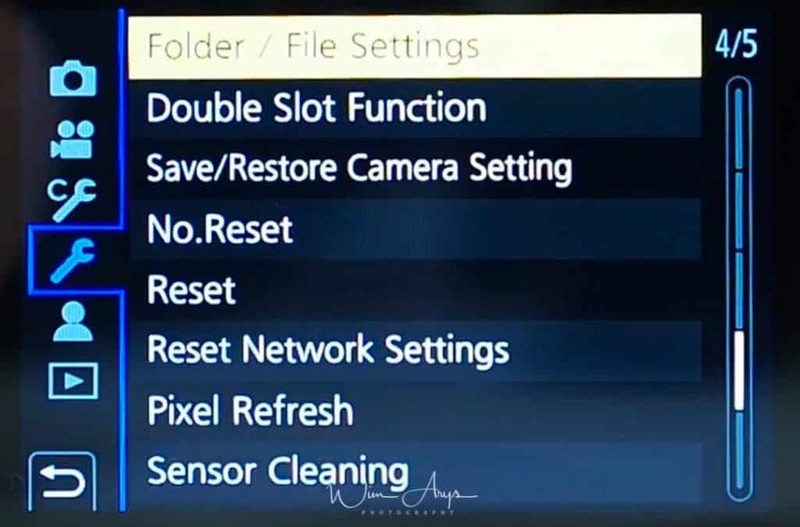 Saving a custom camera is quite simple, set the mode dial to C1, C2 or C3, change the cameras settings to your preferences, go in the Menu to this setting and press MENU/SET on the screen. You have already probably set time and date when you first turned on the Panasonic GX9, but you can also change this here. Sets the times for the region where you live (HOME) and your travel destination (DESTINATION). Time and date will be altered to reflect the local time and date at your travel destination. If you set Travel Setup, elapsed days of your trip i.e. 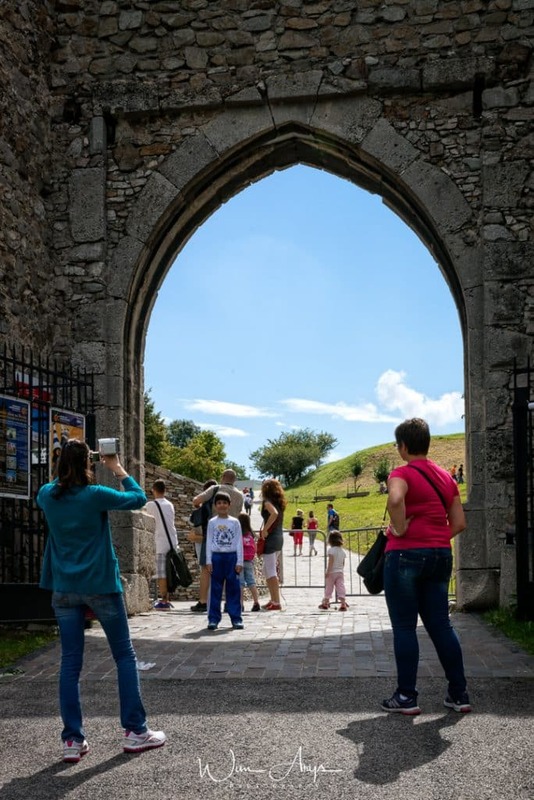 which day of the trip based on its departure and return dates will be recorded The travel date is automatically canceled if the current date is after the return date. If you set Location, the name of the travel destination that you enter will be recorded. It’s possible to control your Panasonic GX9 with a smartphone or a tablet, display pictures on TV, print Wirelessly, Send images to a PC or use Web Services from Panasonic all via WiFi. To use the Wi-Fi function on this camera, a wireless access point is needed off course. 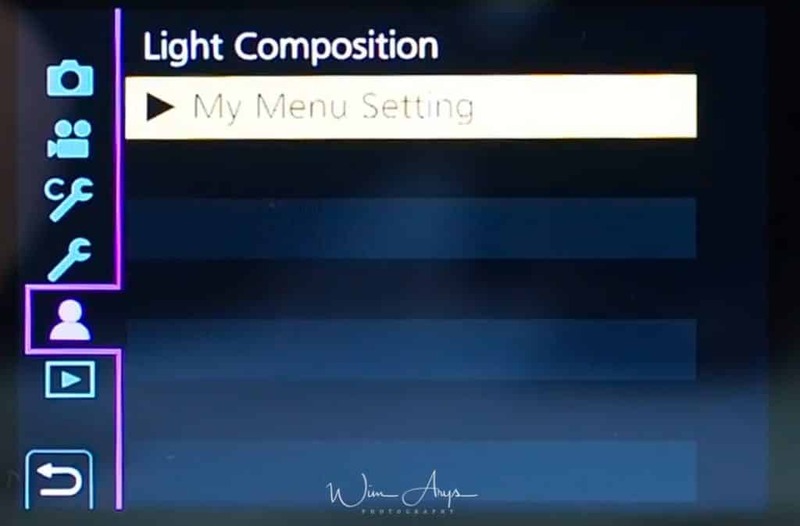 By default, Wi-Fi is assigned to the Fn6 button when the camera is in Recording Mode, while it is assigned to Fn1 when the camera is in Playback Mode. You can assign it to any button you want. When you want to connect to WiFi, simply press this button. Priority of Remote Device: Sets either the camera or the smartphone as the priority control device to be used during remote recording. Wi-Fi Password: You can improve security by enabling password entry for a direct connection to a smartphone. LUMIX CLUB: Acquires or changes the “LUMIX CLUB" login ID. PC Connection: You can set the workgroup. To send images to a PC, a connection to the same workgroup as the destination PC is required. Device Name: You can change the name (SSID) of this unit. Wi-Fi Function Lock: To prevent incorrect operation and use of the Wi-Fi function by a third party and to protect saved personal information, protect the Wi-Fi function with a password. Network Address: Displays the MAC address and IP address of this unit. Approved Regulations: Displays the certification number for radio regulations. You can also connect to your Smartphone, Tablet or TV if your device has the Bluetooth functionality. A function called pairing is needed in order to establish a connection. You’ll find it in this menu, remember to also turn Bluetooth on if you want to do so. 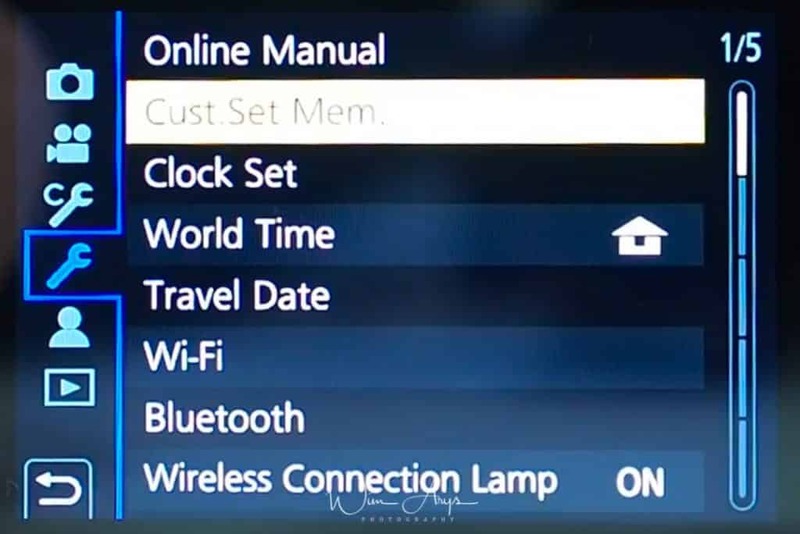 This enables/disables the wireless connection lamp. This allows you to set the electronic sound and the electronic shutter sound. Remember this will be off if you’re in Silent Mode! If you’re using a headphone, you can adjust the volume here. These settings will determine the way the camera handles inactivity on your part to save battery life. Sleep Mode: The camera is automatically turned off if the camera has not been used for the time selected on the setting. Auto LVF/ Monitor Off: The monitor/viewfinder is automatically turned off if the camera has not been used for the time selected on the setting. Power Save LVF Shooting: If you display the monitor using the viewfinder/monitor automatic switching function, the camera will turn off automatically after being left idle. This sets the monitor frame rate to either 120fps or 60fps. 120fps will run smoother at the cost of battery life. This sets the viewfinder frame rate, to either 60 or 120fps. Again, at 120 fps you’ll see movement smoother at the cost of battery life. This displays the monitor and viewfinder screens in red. It reduces the difficulty in seeing the surroundings caused by brightly-lit screens at night or in any low-light environment. Brightness, color, or red or blue tint of the Monitor/viewfinder can be adjusted. 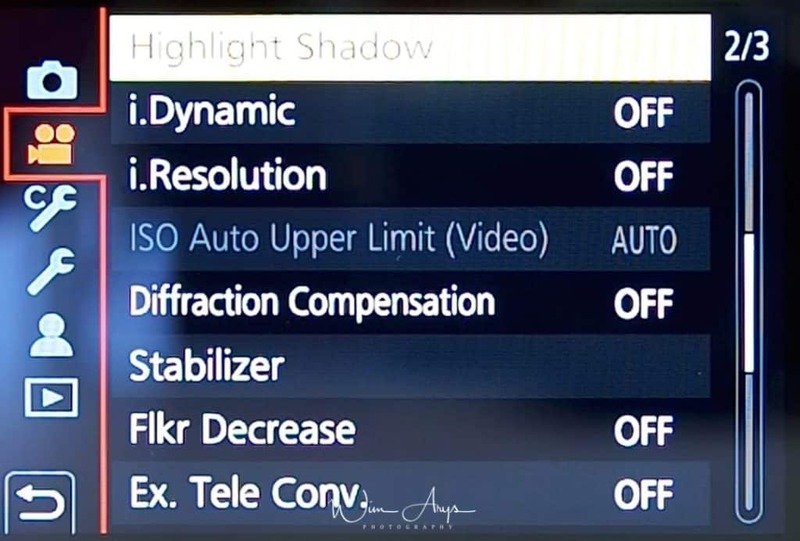 These settings will affect how and when brightness of the monitor is adjusted. Auto: The brightness is adjusted automatically depending on how bright it is around the camera. Mode 1: Makes the monitor brighter than normal. Mode 2: Set the monitor to the standard brightness. Mode 3: Makes the monitor brighter than standard. 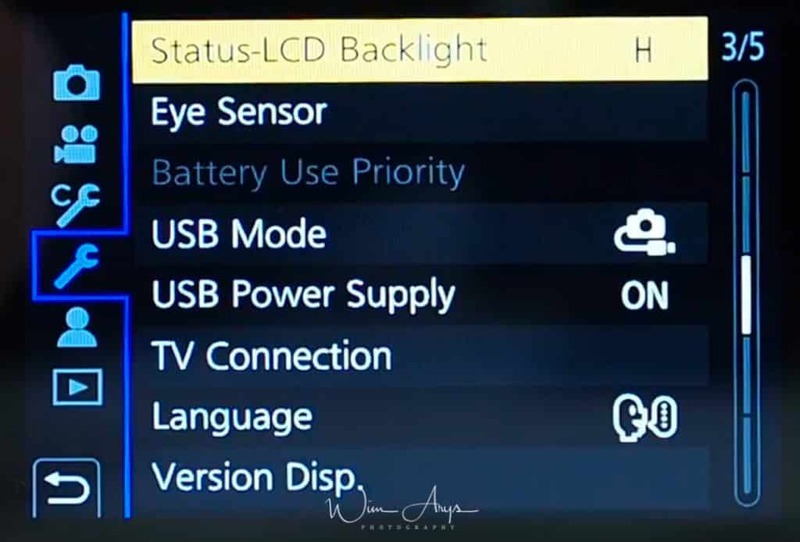 You can set the LCD Backlight to High, Low or Off. Sensitivity will This will set the sensitivity of the eye sensor. LVF/Monitor Switch will This will set the method for switching between the monitor and viewfinder. Sets the communication method when connecting using the USB connection cable. Select on Connection: Select this setting to select the USB communication system when connecting to another device. PC Storage: Select this setting to export images to a connected PC. PC Tether: Select this setting to control the camera from a PC installed with supported software. Pictbridge PTP: Select this setting when connecting to a printer supporting PictBridge. Supplies power via the USB connection cable when the camera is connected to a PC or PowerBank. Set the language displayed on the screen. This enables the firmware versions of the camera and lens to be checked before an upgrade for instance. Set the folder and file name patterns in which images are to be saved. Save the camera’s setup information to the card. Since saved setup information can be imported to the camera, you can apply the same setup to more than one camera. Reset the file number of the next recording to 0001. Setup settings Wi-Fi Setup and Bluetooth settings. Custom settings (Face Recog. and[Profile Setup settings. Setup/custom settings (except for Wi-Fi Setup, Bluetooth, Face Recog. and Profile Setup). Wi-Fi Setup (Excluding LUMIX CLUB). Registered device information in Bluetooth and values in Wi-Fi network settings. It will perform optimization of imaging device and image processing. Use this function when you start seeing hot or dead pixels in your images. Dust reduction to blow off the debris and dust that have affixed to the front of the imaging device is performed. 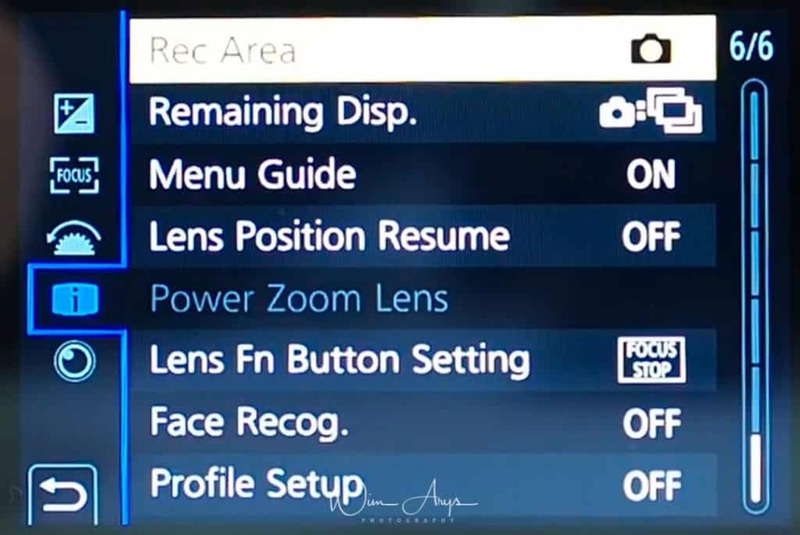 Adjust: Hold the camera in a horizontal position, and press MENU/SET. The level gauge will be adjusted. 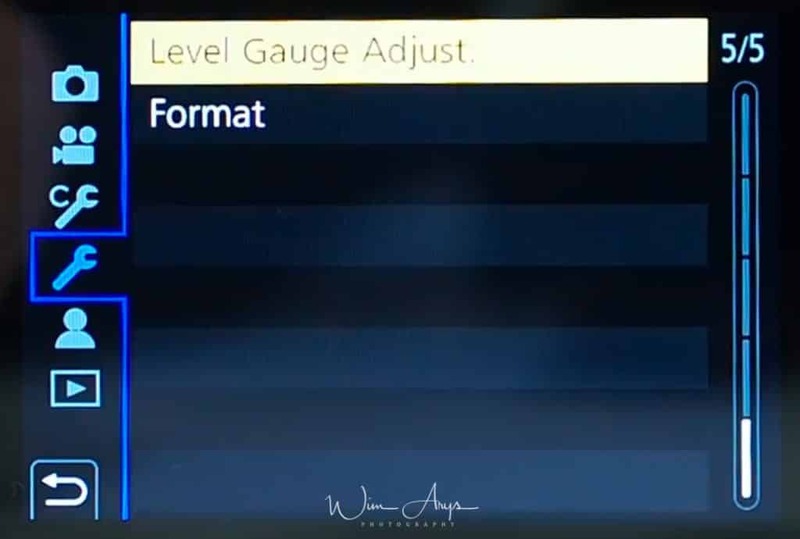 Level Gauge Value Reset: Restores the default level gauge setting. Format the card before recording a picture with this unit. Since data cannot be recovered after formatting, make sure to back up necessary data in advance. Select multiple frames from 6K/4K burst files that you wish to combine in a composite image. Very cool feature. Parts of the image that are brighter than the preceding frame will be superimposed on the preceding frame to combine the frames into one picture. You can register frequently-used menus and display them in My Menu. You can register up to 23 menus for quick access. Add: Specifies the menu to be displayed in My Menu to register it. Sorting: Rearranges the menus displayed in My Menu. Select the menu you want to move and set the destination. Delete: Deletes registered menus from the displayed menu list. Display from my menu: Sets the type of the menu screen to be displayed. ou can play back the pictures you have taken in synchronization with music, and you can do this in sequence while leaving a fixed interval between each of the pictures. You can also put together a slide show composed of only still pictures, only motion pictures, etc. You can change the settings for slide show playback by selecting [Effect] or [Setup] on the slide show menu screen. Playback in Normal Play, Picture Only or Video Only can be selected. You can set protection for pictures you do not want to delete by mistake. Delete all the pictures not set as ratings. Checking the rating level on the file detail display of an operating system, such as Windows 10. You can add text (comments) to pictures. After text has been registered, it can be stamped in prints using Text Stamp. You can clear and replace all information relating to face recognition in selected images. You can process the pictures taken in RAW format. The processed pictures will be saved in JPEG format. White Balance: Allows you to select a White Balance preset and adjust it. If you select an item you can process the image with the setting at the time of recording. Brightness correction: Allows you to correct the brightness within the range between – 2 EV and +2 EV. Photo Style: Allows you to select a photo style effect. i.Dynamic: Allows you to select an i.Dynamic setting. Contrast: Allows you to adjust the contrast. Highlight: Allows you to adjust the brightness of bright portions. Shadow: Allows you to adjust the brightness of dark portions. Noise Reduction: Allows you to adjust the noise reduction setting. i.Resolution: Allows you to select an i.Resolution setting. Sharpness: Allows you to adjust the resolution effect. You can save pictures of a 6K/4K burst file that were extracted from any 5 second period at once. Select multiple frames from 6K/4K burst files that you wish to combine. Parts of the image that are brighter than the preceding frame will be superimposed on the preceding frame to combine the frames into one picture. Remove unwanted objects and such right from the camera menu. The erasure operation can only be performed by touching. Clear Retouch automatically enables the touch operation. You can stamp recording information like names, dates, places on recorded images. Copy images on the card to the other card. To allow easy posting to web pages, attachment to e-mail etc., picture size (number of pixels) is reduced. You can enlarge and then clip the important part of the recorded picture. Rotate pictures manually in 90 degree steps. 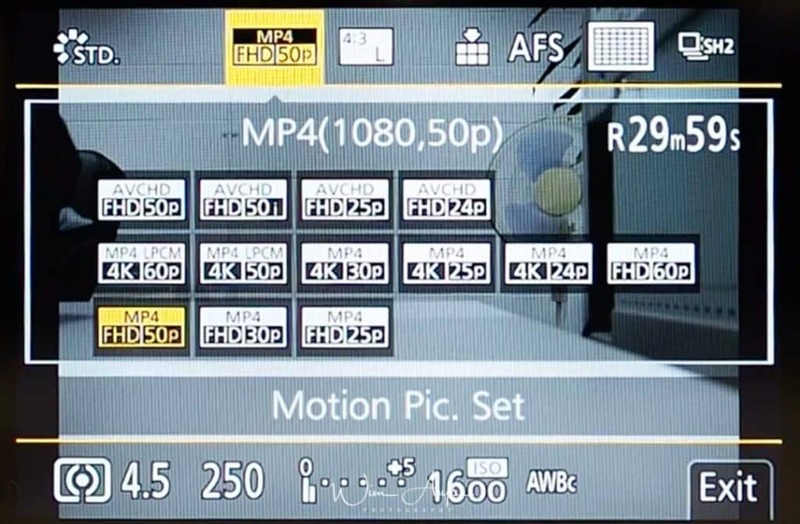 Recorded motion picture and 6K/4K burst files can be divided in two. It is recommended for when you want to divide a part you need with a part you do not need. This function allows you to create a motion picture from a picture group recorded with Time Lapse Shot. A Motion picture is created from group pictures taken with Stop Motion Animation. This mode allows you to display pictures vertically if they were recorded holding the camera vertically. You can set the order in which the camera displays images during playback.Either via file name or date/time. This sets which option, Yes or No, will be highlighted first when the confirmation screen for deleting a picture is displayed. The most commonly used settings can be accessed through what is called the Q Menu. This is the FN2 button that you’ll find right next to the screen, above the trash bucket button. The features that can be adjusted using Quick Menu are determined by the mode or a display style the camera is in. This applies only to Jpeg images, and the RAW preview when you load them into an app like Lightroom.. You can select a colour effect here. You can change bitrate and frame-rate for video here, as well as select the appropriate movie container. You can quickly change picture size and picture quality here for your Jpeg’s. Quality wise, you can choose between Small (S), Medium (M) and Large (L) files sizes. Obviously, Large will have the best quality Jpeg’s, at the expense of larger files. If you only shoot Jpeg (and not RAW) set it to Large. If you shoot both (Jpeg+RAW, see next screen), you could set it to small or medium since you’ll always work with the RAW in post processing. This way, you’ll still have a Jpeg for sharing quickly online or as a reference whilst still saving some space. Probably the most important setting is Quality. You can select either Jpeg, where the RAW data from the sensor is processed by an in-camera algorithm to produce a viewable image, or save your images in this RAW format. RAW retains all the data of the sensor, and is meant to be edited afterwards in a desktop application like Lightroom or Luminar. Saving as RAW means that you have much more creative freedom afterwards to push shadows or pull highlights, sharpen and enhance your image in any way you please. A Jpeg retains only a fraction of this information, according to the algorithm inside the camera which might or might not suit your style and/or needs. This allows the focusing method that suits the positions and number of the subjects to be selected. There are 6 different methods available, each suited for different scenarios. A person’s face, eyes, and body (the entire body or the upper half of the body) are automatically detected. When the camera detects a person’s face or body, an AF area is displayed over the detected person. Yellow: This is the AF area for the person to be brought into focus. The camera automatically selects the person. White: These are the AF areas for people other than the person to be brought into focus. This type of AF area is displayed when more than one person is detected. When a person’s face or eyes are detected, the eye closer to the camera will be brought into focus, if the eyes are inside the yellow frame. The camera can detect the faces of up to 15 people. To specify the person or eye to be brought into focus, align an AF area with the desired person or eye. You can do so easily by touching a person indicated with an AF area. Use a button: aim the AF tracking frame D over the subject, and press the shutter button halfway. Use the touch screen: touch the subject on the screen. If it fails to lock, AF area will flash in red, and disappear. The AF area turns yellow while the subject is locked and green while the shutter button is pressed halfway. Press the Menu button to cancel the lock. Widest setting with all AF points used. 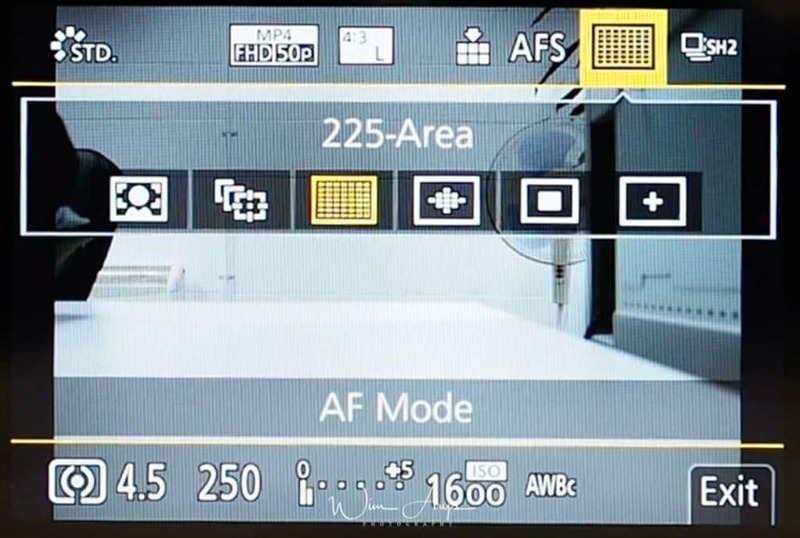 Up to 225 AF areas can be focused. This is effective when your subject is not in the center of the screen. From among 225 AF areas, you can freely set the optimum shape of the AF area for the subject. The camera focuses on the subject in the AF area on the screen. You can achieve a more precise focus on a point that is smaller than 1-Area. If you press the shutter button halfway, the screen that lets you check the focus by enlarging it. You can choose your bust shot setting here for continuous drive mode. Burst shooting means that you’ll shoot continuously when you press the shutter button. You can apply different Burst Mode settings to Burst Shot 1 and and Burst Shot 2 Setting in these menus. 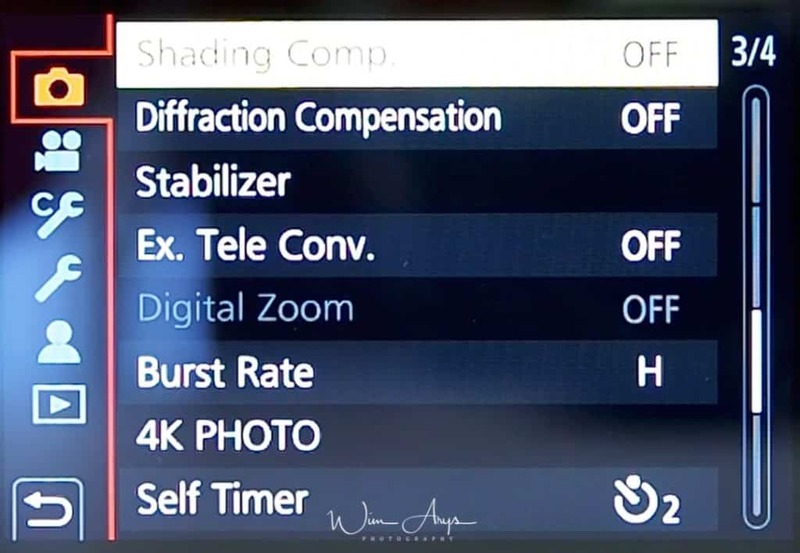 If you feel like your Lumix GX9 is over- or underexposing your images (or you want to purposely underexpose), you can dial in what is called exposure compensation here. A range of plus minus 5 is available here to correct the auto exposure of the camera. So this was a quick run-though of all the Panasonic GX9 Menu items, with pointers, tips and tricks along the way. This information should get you familiarised with this fantastic mirrorless camera. If you would like any clarification or extra information on any functionality here, let me know through the comment section below. Happy shooting! thank you for this short and very informative article. One question: How do I stop this quite irritating happening of touching the screen resulting in taking a picture? Go to the Operational Menu page 4 Mogens. Touch Settings Enables/disables the Touch operation. Doesn’t this article relate to the Panasonic Lumix G9 and not the GX9 as stated?